Joreels Casino Review (2019) ++ CLOSED ⛔ - Choose an Alternative Inside! Unfortunately, Joreels are no longer accepting new players. Browse through our other online casinos to find an alternative platform. Stylish and mysterious Joreels Casino was launched in 2017, and its good usability with the quirky theme has managed to attract players. The world of Joreels Casino takes place in the United States during the Prohibition, when secret pubs were popular even among casino players. Despite the “oldish” theme, the casino’s game selection is modern and includes slots from the popular software providers such as NetEnt and Microgaming. Before going forward in the Joreels casino review, make sure your country isn’t on the restricted countries list. Afghanistan, Belgium, Bulgaria, Denmark, Estonia, Ethiopia, France, Hong Kong, Hungary, India, Iran, Iraq, Israel, Italy, Jordan, Kuwait, Pakistan, Philippines, Portugal, Romania, Singapore, South Africa, Spain, Syria, Turkey, United States, Yemen. While we aim to keep our Joreels Casino Review up to date, we still recommend checking the casino sites own website for the most recent information. So this means, that if you deposit £50, you’ll have £100 to play with. At the moment they don’t offer any free spins along with their welcome bonus, but Joreels does offer occasional offers and other promotions, where you can catch more free spins. Not bad! So, if you deposit €100 on your first deposit, you’ll have €200 to play with. And if you deposit €50 on your second deposit, you’ll have €75 to play with. Claiming the bonus from Joreels casino does not require a bonus code. However, the player needs to choose whether they want to accept the bonus or not while making the deposit. Let’s pause the jumps of joy for a minute, and take a look at the wager requirements. Wagers often spoil the fun of bonuses, making the playthrough tedious and time-consuming. However, the wager requirements are pretty high. The playthrough is 35 times the bonus amount plus the deposit. Altogether this is 70 times wagering – which is a bit on the high side. On the other hand, the playthrough for free spins is 49 times before withdrawal. Remember to check which games are included in the wager requirements before playthrough. For instance, Blood Suckers is not included and thus doesn’t count towards playthroughs. 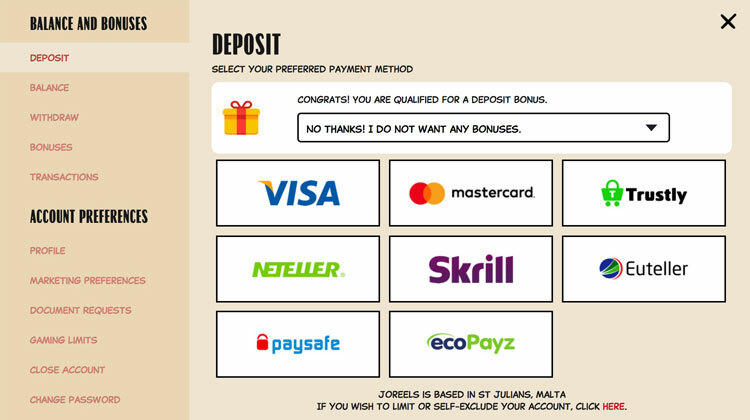 Joreels offers multiple ways to deposit and withdraw funds. The comprehensive list is available on their website, and they add different methods every now and then. Deposits and withdrawals can be made with credit and debit cards, e-wallets and bank transfers, such as Visa, Trustly, Neteller and Skrill. Withdrawal times at Joreels are reasonable: e-wallet withdrawals are completed the same day, and credit and debit card withdrawals within 3-5 business days. Joreels casino offers a very good experience on mobile as well. Despite not having a dedicated app for either Android or iOs. But the browser version works just fine. The game selection on mobile has steadily grown since launch and there are now over 300 games available on mobile. Due to licensing, the selection may vary between countries. Support works on mobile as well and based on the Professor’s experience, the help is quickly available. Money transfers can be made on mobile as well. Joreels casino operates on a popular iGaming Cloud platform owned by GiG (Gaming Innovation Group). The popular casino platform is widely used in the industry by such brands as Rizk Casino and Cashmio casino for example. Well yes, Joreels casino is another white label casino. However, this isn’t necessarily a bad thing. GiG, which is a stock listed company (GIG:NO) doesn’t really want to be dealing with rotten apples. So it would make sense that they choose only reliable partners to work with. After all, they are still working under the same licenses that are granted to GiG (UK, Malta & Curacao). Did you try Joreels Casino? Leave your own Joreels Casino Review below!